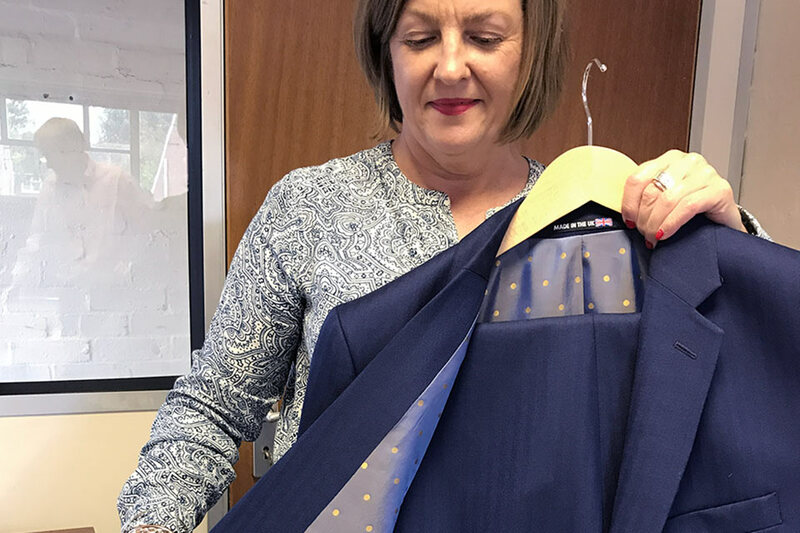 A key part of our Grey Fox Styles the Tusting Men story was meeting one of London’s loveliest tailors, Susannah Hall. David Evans recommended Susannah to Alistair as an excellent source of a new suit – and the Grey Fox certainly knows his sartorial stuff. 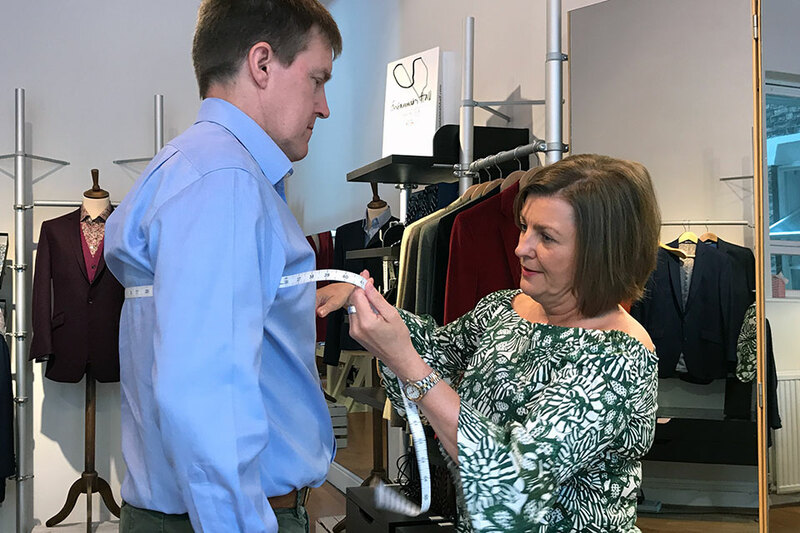 Having never before had the joy of a made-to-measure garment save for his wedding waistcoat, Alistair revelled in the attention that came with the process, especially as he was attended to not only by Susannah but also top gents’ personal stylist, Sarah Gilfillan of the Sartorialab. The process kicked off with a session to cover measuring and choosing the fabric, lining and details for the suit (covered in Part 1). This was followed by a fitting a few weeks later when the bones of the trousers and half the jacket had been assembled by the expert tailors in Susannah’s British workshop. These were put together just enough to show how the pieces might hang, and the purpose of the fitting was to allow all aspects of the fit to be adjusted ‘live’ on the future wearer. So, Alistair’s ultra-square shoulders and slim legs could be accounted for here. 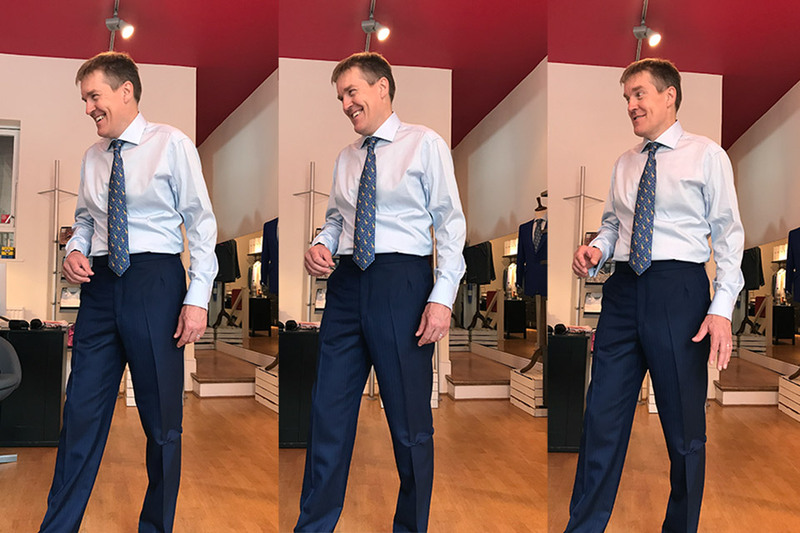 Such is the care that goes into creating a made to measure suit that after this first fitting, the garments are fully taken apart and sewn together again from scratch. So in fact, the suit is actually made twice. Susannah took a great deal of care to check and double check the length of the trousers – Alistair was sure to wear his new Crockett and Jones suede brogues for the fitting! – and minute adjustments were made to the width of the trousers and the curve of the back of the jacket to make the fit just-right. Finally, the great day-of-delivery came and Susannah personally delivered the suit to Alistair at Tusting HQ. It was perfect! The beautiful bright navy Harrisons of Edinburgh wool being perfectly complemented by the fun spotty lining from Barrington’s and hitting just the right balance of conservatism and elegance for Alistair’s personal style. Result: a suit that delivers a confidence and feel-good factor that feeds the soul and fills the positivity banks. Oh and it looks gorgeous too! Susannah, was Alistair clear in his vision for his suit? Did he have much guidance from David and Sarah? Alistair said that he wanted a suit that would be useful for lots of things. Sarah and I agreed that the blue would be perfect for him. I thought Alistair would look great in a textured cloth, so I suggested a herringbone which was the perfect choice. With Sarah’s styling experience and my tailoring, we put together all the ideas to make the best suit possible, both in the detail and in the fit. How many people worked on the suit and how many hours went into making it? I have a team of tailors who make up the suits, each responsible for different elements. It is difficult to say exactly how long it takes from start to finish as every garment is unique in its journey from fabric length to suit. What were the challenges (if any!) in making a suit for Alistair? The main challenge for me is to make sure the suit incorporates any special figuration, such as a drop shoulder, a round back, or in Alistair’s case his square shoulders. It is important that I notice these idiosyncrasies at the measuring stage as I need to feed this information to my tailors for the suit to be cut correctly. It is incredibly difficult to integrate these physical attributes to a finished suit. When you started out in tailoring, you were one of few female cutters in the trade, traditionally, women held finishing roles and seldom made it to front of house, coat making or cutting. How was that at the time? I started in the early 90s when there were very few female tailors and have always been involved front of house. Now it is much more diverse. Over the years there has been an influx of women in the trade many of whom like me have their name above the door and are an integral part of the tailoring world. Do you know many of the women in the trade now? Do you think it makes a difference to have more women in the trade? I do know a lot of the women in the trade, we try to keep in touch and also offer each other support. I think it is important to have a balance, although there are still so many more men in this trade than women. I believe we offer a different perspective and fresh outlook. We have also influenced the change in regard to the increased number of women now involved. Do you think there is a difference between the City tailors and those of Savile Row? Have you ever been tempted to the Row? 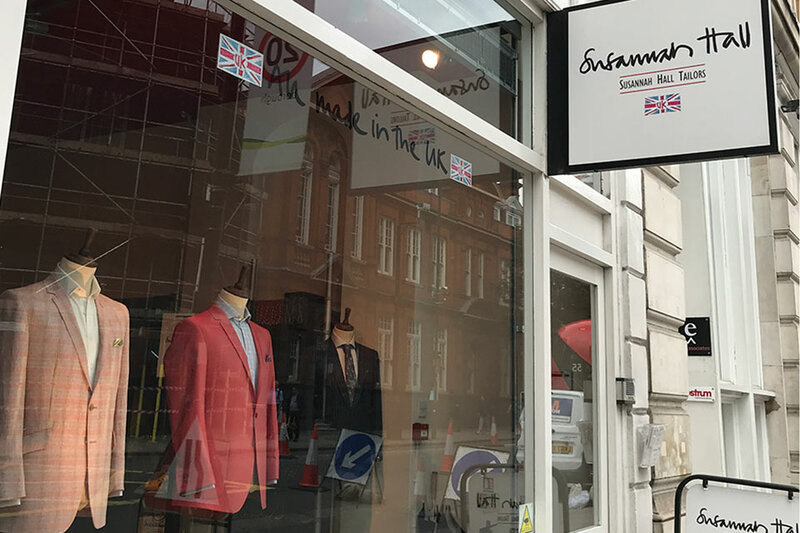 There used to be a real divide between the City and Savile Row however over the last 10 years or so newer tailoring companies have moved in to the Row and other very traditional tailors have moved in to the city. This crossover has made the industry so positive and exciting. We all look forward to getting together twice a year for the BTBA at Merchant Taylors hall. Clerkenwell is our home. We enjoy using social media and have found it a very positive platform to engage with existing and new clients. Posting on social media is much more effective for us than traditional print advertising. We can immediately post images of garments as they arrive from our tailors which in turn results in responses from social media users all over the world. That kind of instant feedback is hard to find anywhere else. David Evans of Grey Fox is a great Ambassador for British Craftsmanship. Was it a lot of fun to collaborate with David too on this project? We have known David for a few years now and have worked on many exciting projects. It is so easy to come up with ideas as we are on the same page when it comes to British made. At SH, we have always made in the UK and it is wonderful when we come across others who are so supportive. It was such fun to work on this project with David as he himself has had the SH experience! 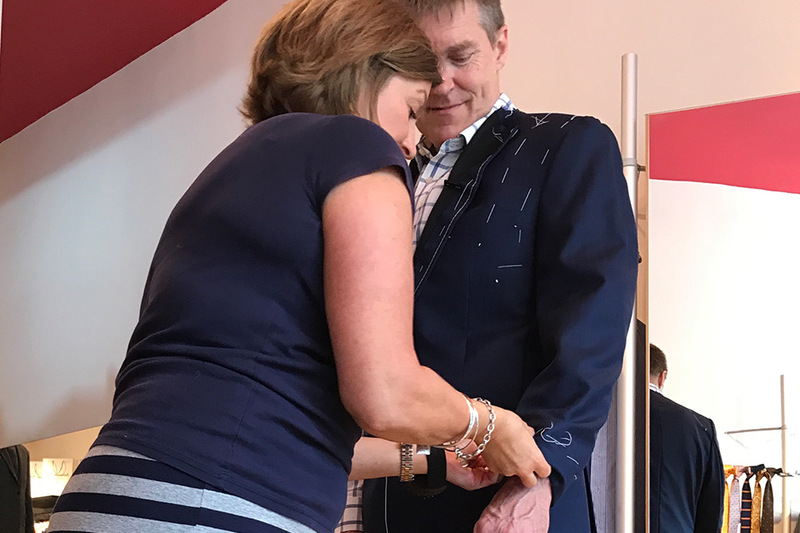 We were so thrilled to work with Susannah to furnish Alistair with his first ‘proper’ suit. A reluctant shopper, Alistair is perfectly placed to benefit from the brilliant skills and advice of the trio of the Grey Fox, SartoriaLab and Susannah Hall. The difference between his previous ‘off-the-peg’ suits and this bespoke one is extraordinary and a life lesson! 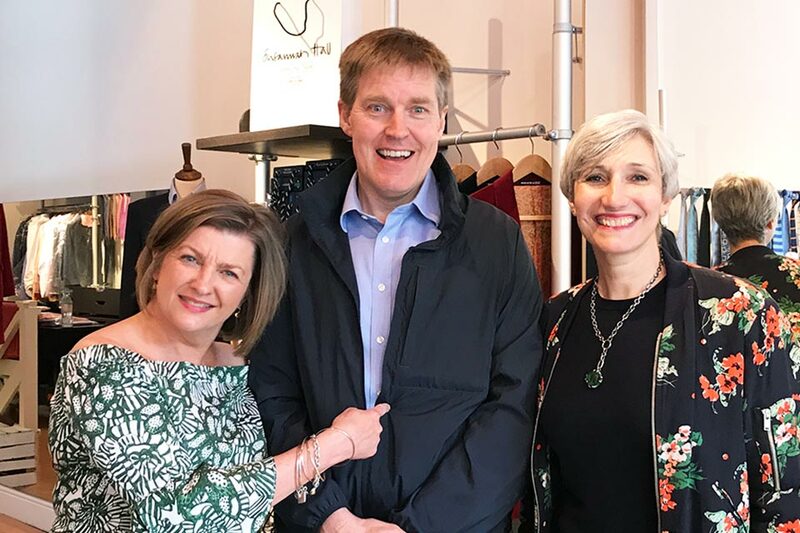 Fittingly, the suit had its first public outing at the launch of the Tusting / Gleneagles range of leather goods in the Ennismore Group’s HQ in the Old Sessions House in Clerkenwell – just down the road from Susannah’s atelier. 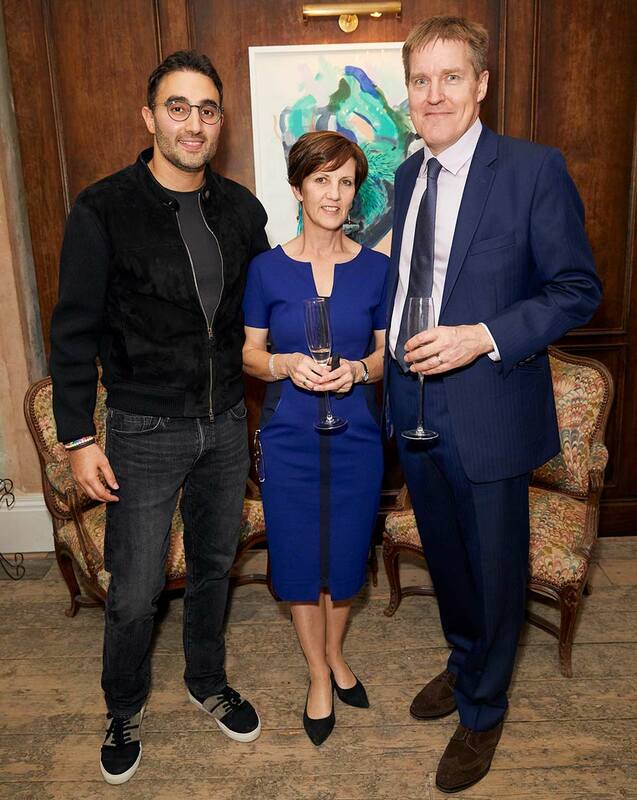 Photo: Sharan Pasricha, CEO of Ennismore Group with Alistair and Gillian Tusting at the launch party.